Gorgeous views, a big bath and a deck to lounge on. Property 5: Gorgeous views, a big bath and a deck to lounge on. Tree Tops - idyllic, peaceful getaway. Property 6: Tree Tops - idyllic, peaceful getaway. Twin Creek Cottage- a secluded forest retreat. Property 10: Twin Creek Cottage- a secluded forest retreat. 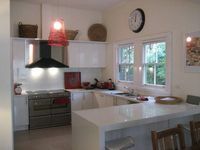 Property 16: 5 Star Accommodation for up to 6 near Healesville, stunning forest location. Property 23: Best location in Warburton! Property 29: The Perfect Location. Property 32: Gingers on The Hill. Mountain Views, 300 metres to River, Shops and Main St.
Property 42: Botanica Editions -Yarra Valley's most exclusive, private self-catering retreat. Our 3 days at Kookaburra were wonderful and relaxing. Amanda made us feel &ldquo;at home&rdquo; in this immaculate cottage. Homemade bread, jam, cereal and other basics were a wonderful treat. Didn&rsquo;t get up the courage to try the vegimite though! There was so much to explore in the area - wineries, small towns and the Dandenong mts. We loved our visit to Sydney and this was a great follow up.